In a shocking turn of events, several Americans have recently contracted the Ebola virus. The virus has been ravaging the West African countries of Liberia, Sierra Leone and Guinea since December of 2013. It is estimated that 5,000 people have died in those countries. Several cases have now been identified in the United States. The most documented case is Thomas Eric Duncan, a Liberian immigrant who brought the virus to Dallas. Nurses Nina Pham and Amber Vinson both contracted Ebola while caring for Duncan. Journalist Ashoka Mukpo contracted Ebola while covering the outbreak in Africa for NBC News, and Craig Spencer of "Doctors Without Borders" just checked in to Bellvue Hospital in New York City with Ebola. Unfortunately for these people... the Affordable Care Act does not cover treatment of the Ebola virus. 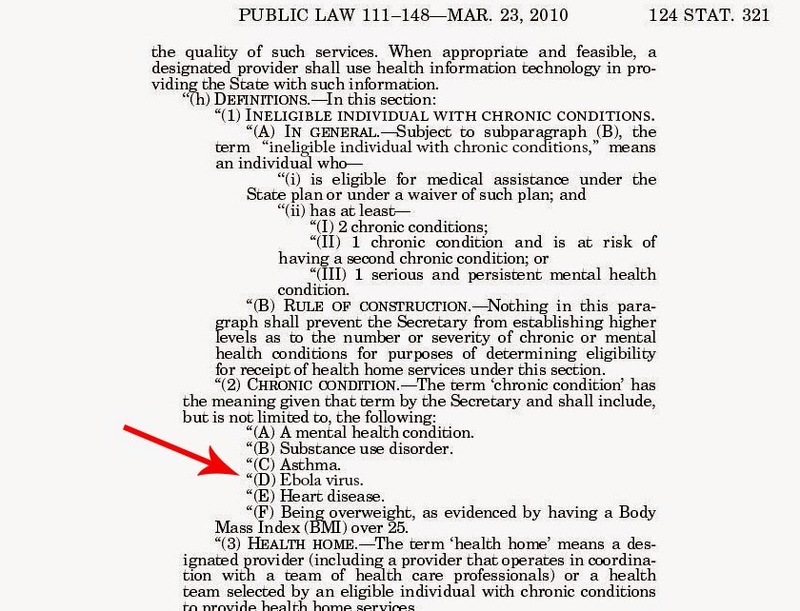 Here is an excerpt from the law that lists the pre-existing "chronic conditions" that are not covered under the new plans. Nobody is sure what to make of Ebola in the United States. Several cases seem to have been eradicated, but many people remain skeptical and concerned. The Center for Disease Control (CDC) seems to have underestimated the precautions necessary to stop the spread of the virus. In an effort to avoid a public panic, they instead created a great mistrust of their agency. Most Americans are convinced the disease can spread when someone coughs or sneezes, and it is clear that healthcare professionals are more at risk than the general public. Regardless of how contagious the virus can be, getting care will prove to be an issue.